In October 2017 I had a solo show of recent work at General Fine Craft in Almonte. 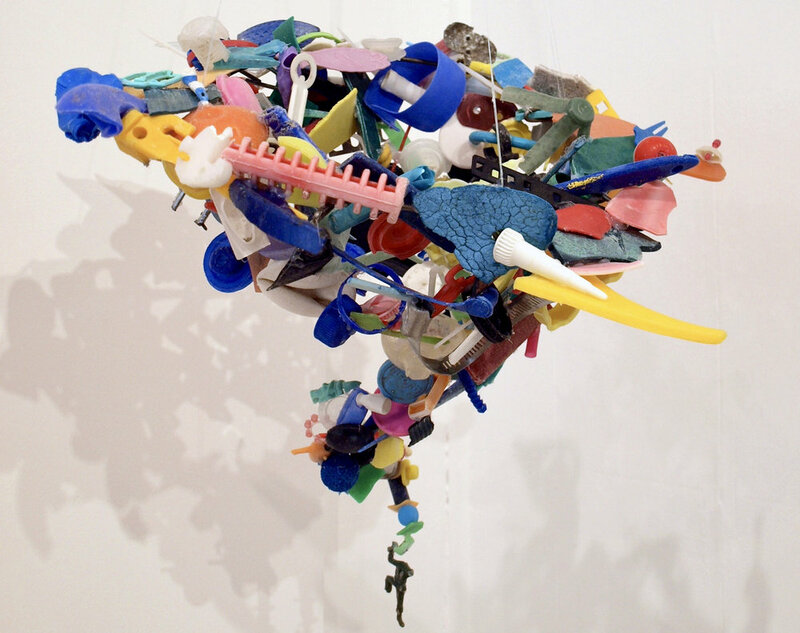 It was the culmination of two years work that included sculptures made of plastic found on the beaches of Lake Ontario, paintings and a folded paper wall array. I felt a great sense of satisfaction and exhilarated but creatively spent. Just as one eats ginger to clean their palette between sumptuous pieces of sushi, I needed to take a break to refill my creative cup. Going to art exhibits to see what other artists are doing is an essential part of this process. In December, I visited the National Gallery of Canada to see the Canadian Biennial 2017. According to the NGC's website, "The fourth edition of the Canadian Biennial brings together a comprehensive selection of works acquired since 2014 by the Gallery’s departments of Contemporary Art, Indigenous Art, and the Canadian Photography Institute, and is the first to date to feature artists working both in Canada and internationally.". The works range from sculpture, to painting, to photography and multi-media. If one or two pieces in a show move me, I consider it a worthwhile trip. In this show, many pieces effected me quite profoundly. The first one was Nick Cave's Soundsuit, 2015, a mixed media piece which includes gramophone horn, ceramic birds, metal flowers, strung beads, fabric, metal and mannequin is described as "a poignant statement on the day-to-day danger of being a black man in the United States today." Ken Monkman's Casualties of Modernity a mixed-media installation was another standout - aptly described as "a witty, captivating statement on cultural appropriation and so much more, from an artist of breath-taking talent." Later in December, I went to New York - visiting The Metropolitan Museum of Art and the new Whitney Museum of American Art and have to say that, in my humble opinion, the Canadian Biennial was as well-curated and thought-provoking as any of the shows I saw in NYC - and perhaps even more so. There is something for everyone at the Canadian Bienniale which ends in March. A must-see for anyone who to top up their creative cup.